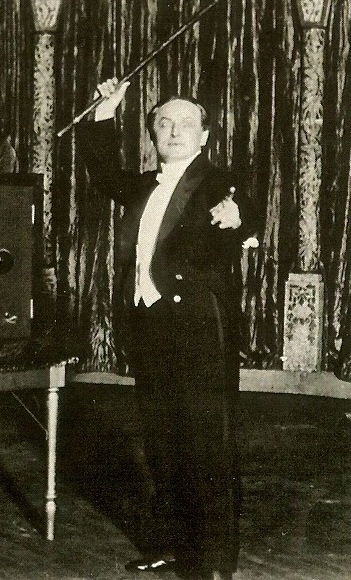 The other day the Magic Collectors Association revealed their Friday morning schedule for the upcoming Magic Collectors Weekend in Chicago (which includes my own little Houdini talk). Now they've revealed the program for the evening, and it's ALL Houdini people! First up, William Pack will detail how he was inspired by Houdini and how he assembled a program about his hero that tours libraries and schools. Following Bill's talk will be a screening of a short television production in which Teller (of Penn & Teller) plays Houdini. According to the MCA, this is something very few people have ever seen. "Arthur Moses offered us – and that’s you, too – something really special. Arthur’s interest, as many of you know (see his ad in Magicol), is in Houdini. Well, Arthur has unearthed something truly wonderful with respect to the master mystifier, and has graciously offered to reveal his discovery, and a few additional things, on Friday evening." I might have an idea of what Arthur is going to reveal, and I can tell you the world of Houdini is not going to be the same come Saturday morning. But that is all I can say! The 43rd Magic Collectors Weekend will be held at the Westin O'Hare near downtown Chicago, May 10, 11, 12. Click here for information on how to register for the weekend. And keep watching the MCA's Mystery & History blog for more program announcements.